Over the past few weeks I had the opportunity to reflect upon a simple, yet profound, truth. You don’t have to be a major celebrity or stashed with cash to love your work. When work is fun, people are happy and the radiance of it can’t be missed. I’ve got a few examples that prove the point. 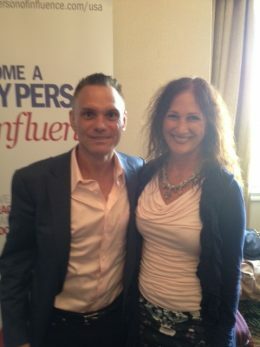 I’m starting with Kevin Harrington, a face you’d likely recognize from season 1 of ABC’s Shark Tank. Kevin’s the mastermind behind the As Seen on TV brand, a passion he’s pursued since the late 1980s. The guru who brought Tony Little from a $40/hour personal trainer to grossing $1B in sales atop his famed Gazelle exercise bike, Kevin’s been having fun experimenting and expanding upon his own brand of marketing genius. Kevin spoke recently about innovation and entrepreneurship. I marveled at this 56-year-old’s passion and energy as he spoke. Meeting with Kevin proved an equal pleasure. His keen interest and sense of continuing inquiry into “What’s next in TV sales” show no sign of slowing down. Always seeking new angles and opportunities, Kevin is as compelled to deliver advice as he is to listen, learn and collaborate with others. You don’t need to be socking tons of money in the bank or even have a face for TV in order to love what you do. A recent morning visit to the Paradise Restaurant in Safety Harbor, Florida demonstrates how the sunshine of work can show up in everyday places. An unexpected morning pit stop into this local establishment literally made my day. 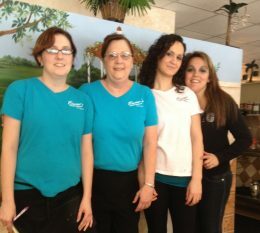 The women who work at Paradise’s neighborhood eatery create the very atmosphere the name of the restaurant implies. With a natural enthusiasm, unfeigned interest in their customers and a sincere joy in serving the public, they light up the day for many. Whether finely attired or dressed in Florida casual, everyone from babies to adults, foreigners to nationals, and snowbirds to civic groups is welcome at the Paradise. “Is Billy here today?” I heard one of the regulars ask Ruthie, a sweetly smiling grandma in the next booth. Looking like one of the customers, Ruthie was munching on breakfast before occupying her position as the Paradise cashier. The women who work at Paradise are both quiet and chatty. With near perfect fluidity, they stick around and make small talk or give patrons space to work quietly. They know their customers’ names, circumstances, favorite foods and how they like them prepared. For a newcomer like me, they were happy to learn I take cream in my coffee and real butter on my English muffin. I picked up a conversation with a guy in the booth next to mine, a retired correctional officer who moved from Buffalo after working 30 years in Attica Prison. For me, the Paradise provided a pleasant time warp with booths overlooking Safety Harbor’s Main Street, its downtown Gazebo and the weekly outdoor farmer’s market. Part diner, part luncheonette, part neighborhood restaurant, the Paradise features eclectic design and familiar old tunes from the likes of Barry Manilow, Stevie Wonder and Gordon Lightfoot. A menu featuring reasonably priced American, Italian, Greek, German and native Albanian food signals it’s a friendly place for all. I asked the servers if I could take their picture for one of my blogs. They were flattered and happy to oblige. Only through inquiry did I learn that one of the servers was also the manager and owner’s daughter. Forget politics and pecking orders here: everyone worked well together, equally at ease in this wonderfully pleasant, service-oriented restaurant. The pay and profile of those who work at the Paradise Restaurant aren’t likely to reach the levels of TV entrepreneur Kevin Harrington or America’s famed fitness trainer Tony Little. Yet the joy they derive from serving good food to a steady stream of happy customers makes them shine. Day after day and year after year, these people love their work – and it shows! Service industries need people who like people. Happy and enthusiastic workers create goodwill, that vital but hard-to-measure component that causes businesses to stand out from their competitors. Picking up on positive attitudes of those who truly enjoy serving became equally as evident a few months ago. The same two flight attendants that caught my eye on a trip to Europe appeared again on my return flight from Amsterdam. Despite completely full cabins on both routes, these women enjoyed being in the company of others – even the babies and little children having challenges adapting to their unfamiliar environment. Curiously, I watched from a distance as these women performed their “job”. With sparkling eyes and smiles that remained on their faces when no one appeared to be watching, the women accommodated a myriad of passenger needs. They pleasantly switched between English and a few foreign tongues. Within the confines of a high-stress, time-sensitive schedule, they flourished and gained obvious satisfaction from their work. Someone once remarked, “Maura, you’re so easily impressed.” It’s true. I naturally notice the unique strengths, talents or otherwise noteworthy qualities in others. Yet who can remain unaware of those who obviously don’t like their work.. . . .
4. Fortunately, I didn’t capture this one in a picture! Providing a complete contrast to the above flight attendant experience, let me share with you another. A decade ago, I boarded a flight from London with a friend. The two of us were thrilled to discover we’d be sitting in a near empty cabin. Giddily noting the extra space and the pleasant service we would anticipate from a flight staff that, for once, wouldn’t be overburdened with a full passenger load, we’d soon learn we were wrongly inspired. Our flight attendant shared neither our enthusiasm nor expectations. An obviously unhappy woman, she spent nearly the entire flight sitting in her seat. Her attention was absorbed in magazines and a steady supply of Pepsi, something she failed to offer the few passengers sitting nearby. “Did that really just happen?” asked Janis, a fiery redhead who stood 6 feet tall with a frame to match. “I feel like I was just put back in 2nd grade and publicly sentenced to the time-out corner!” The two of us laughed silently – and incredulously. Our flight attendant’s demeanor was imposing, her personality more prison warden than attentive server. What began as an anticipated atmosphere that would match our high-flying spirits quickly morphed into a 20,000 foot drop in altitude. Janis and I spent the rest of the flight minding our business, asking for nothing. By the time this flight attendant felt ready to deliver our meals, Janis and I found ourselves awkwardly thanking her – as if we were somehow imposing on her private time. We joked that requests for a second cup of coffee might cause it to end up in our lap. Obviously, this Ms.-I-Am-A-Senior-Flight-Attendant-But-I-Hate-to-Serve-People did not like her work. It definitely “showed”. Unfortunately, her lack of enjoyment reflected poorly upon the airline that employed her. As a final example of the positive, I’ll serve up someone who absolutely loves his work – and it shows. It’s my husband, Jim Sweeney. With only limited assistance from me over the years, Jimmy built a computer rep firm he’d lovingly cultivated from scratch into a quiet powerhouse and highly lucrative operation. Jimmy was a guy who always loved what he did, but as the computer industry matured he found his work increasingly bureaucratic and creatively stifling. The income remained, but the fun factor had definitely declined. A few years ago, Jimmy and I made way for a new future. We wanted to do something fun and create opportunities to engage in personally rewarding forms of “work”. Today, the same man who was growing frustrated in his former occupation is immersed in a new industry and a new profession – sports entertainment. The guy who formerly brokered computer deals now exercises his bent for the creative and teams it with his passion for sports. He authors comic books for his own alter-ego, a trademarked cartoon microphone character aptly named MIKE. As author of twenty MIKE Sports Comic Books and counting, and armed with embedded affiliate links from the likes of MLB.com, NFL.com and Fathead, Jimmy spins countless stories about what’s best, funniest, and most extraordinary in sports. Employing MIKE as alter-ego to publicize his own thoughts about sports is my husband’s full time gig. He’s at the forefront of a new business paradigm, is constantly growing within the digital space, and networks with some of the biggest names in the business of sports. Awhile back, Jimmy was putting the final strokes to MIKE’s Comic Book on Spiritual Sports Favorites. The book includes religiously familiar themes like Pigeon Heaven, Immaculate Reception, Hail Mary Pass, Amen Corner, and the University of Notre Dame’s famed Touchdown Jesus. Without realizing it, he suddenly uttered :“I love doing this!” The remark was part Freudian slip, part public confession. This was a satisfied guy who probably yearned all his life to do exactly as he pleased. In his case, it meant giving creative rise to his voice and employing his passion for sports as catalyst. His utterance emanated from a mind that knew where he might have been had he not made a mid-life career change to pursue what he loved. This weekend, Jimmy and I were out in search of a new desk and bigger Apple computer for work. Driving around in pursuit, Jimmy reflected upon his late dad. Don Sweeney made a happy living as a truck driver, Trenton bridge toll collector, and part time bartender at the Polish American Club of Central New Jersey. Jimmy spent lots of “windshield time” driving with his dad in the family truck. He also made numerous extended trips to Trenton to visit with his dad in the latter years. Neither my husband nor I have replicated our former incomes, but we’re certainly having fun. We’re doing what makes us happy by engaging in personally satisfying pursuits. 5. 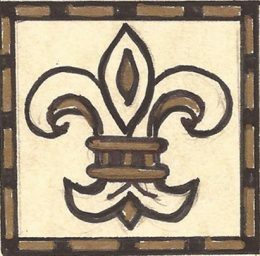 Yours Truly – Maura4u! Decades ago, I was as a young manager in the telecom industry. I remember remarking that I would have performed my job without pay. (Okay, I did need a paycheck, but you get the point!) I loved the people I worked with, the challenges for growth and the opportunities for positive impact my position entailed. Today, I’ve reflected similarly: If no one watched my Maura4u videos, read my blogs or ever purchased my books, I’d still be doing what I do. In my current capacity as Maura4u, I get to report on pleasant reflections, happy thoughts and news that others can use to brighten their personal outlook. Doing what I do today makes my life brighter than I could have ever imagined. Do you love what you do? Are you finding ways to enjoy where you are, who you’re with and what it is that you’re doing? If not, it’s my hope that you discover new ways to “work” your way into something fun, satisfying and enjoyable. May you love what you do, and may it brightly shine through!